“Fiery Lanterns” is an expression of sustainability and simplicity, in a modern consumerist world when simple ancient systems are taken for granted. 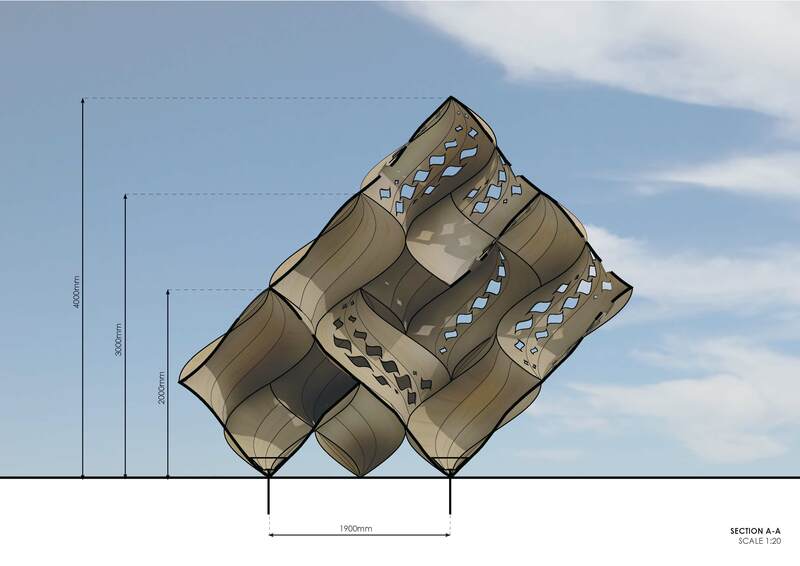 In the theme “Caravansary”, the installation aims to initiate a cultural exchange, encasing Burners and creating crossroads to connect world’s neighbourhoods. 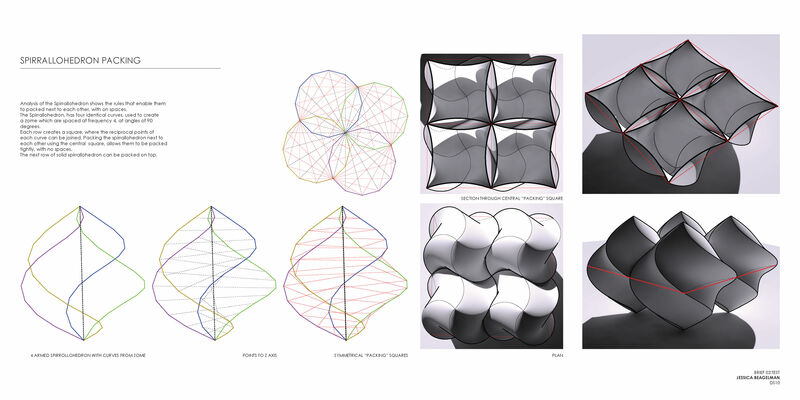 The installation shows the possibilities of analysing natural mathematical systems, which we commonly interact with in everyday life and reinterpreting them. 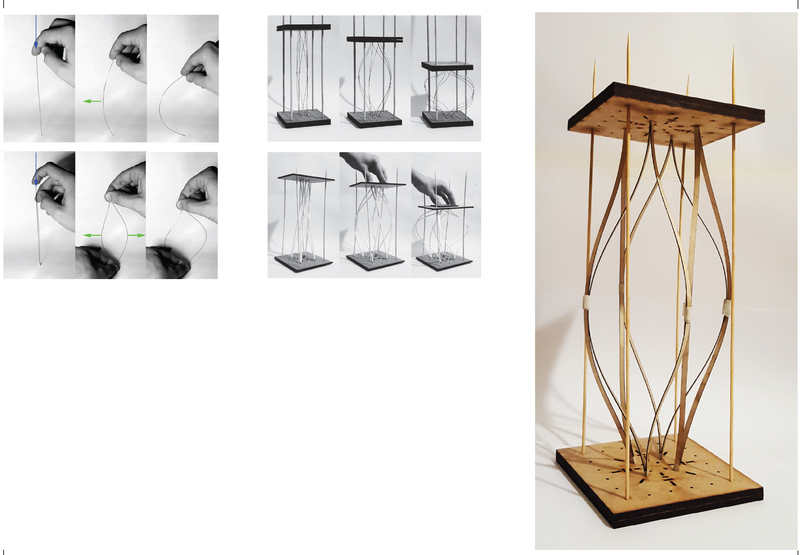 Research to produce “Fiery Lanterns”, has allowed detailed prototyping of bending timber to create a memory structure. 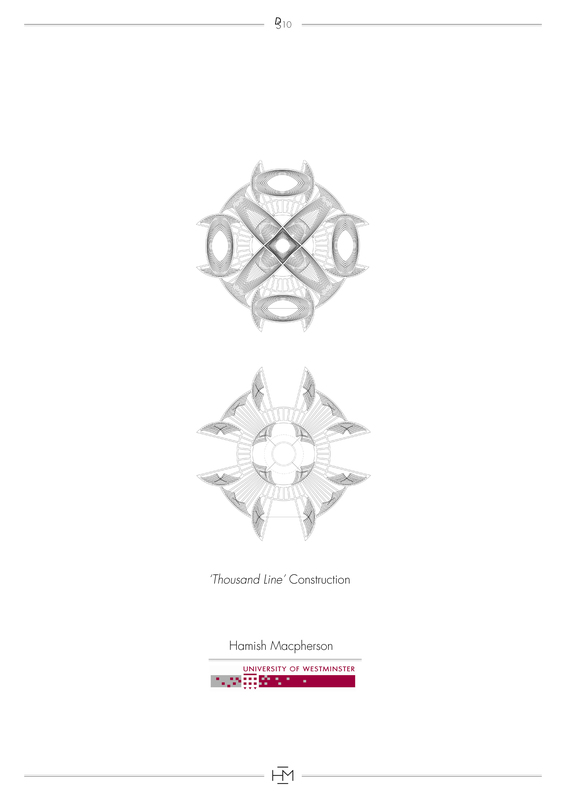 Testing it to destruction and pushing the understanding of its properties, utilising its strengths and minimalising its weaknesses. 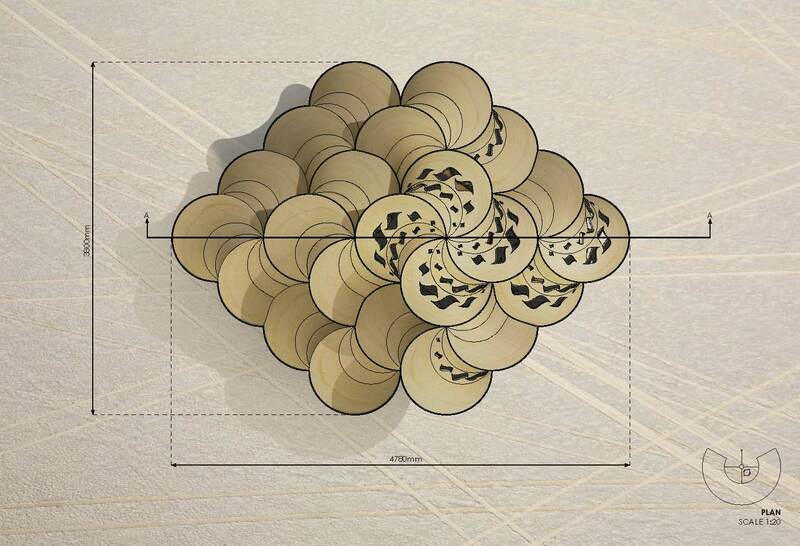 The installation takes inspiration from natural repeating phyllotaxis spirals in sunflower heads. 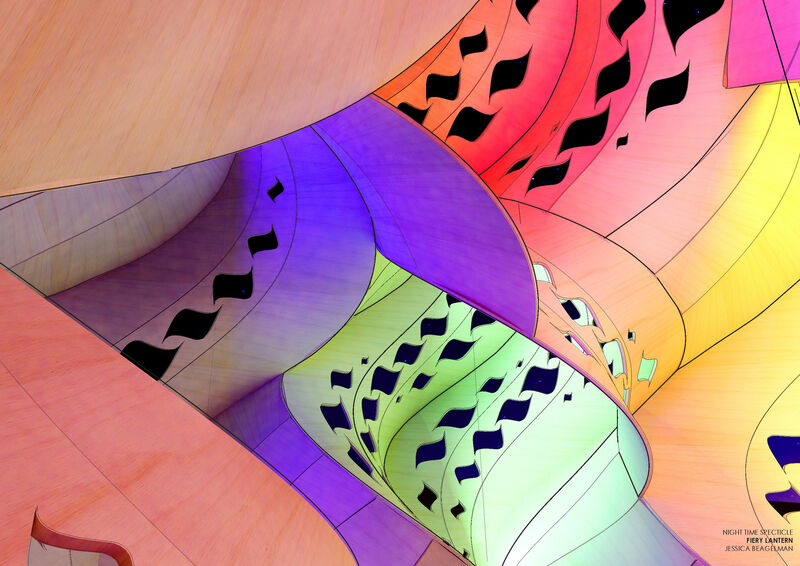 These interconnecting spirals are orientated by the mathematical rules of the golden ratio and governed by successive Fibonacci numbers, to create beautiful majestic forms. This is translated into the identical panels of the “Fiery Lantern”, simply stitched together; they twist and turn to create an ornate case to protect the flames within. This is communicated to the Burner by the symmetry in the design and how you interact with the lanterns. It gives a modern definition of the possibilities of encasement in wood and builds on what is capable using this system. “Fiery Lanterns” are made from four identical stitched panels, which are rotated around each lantern’s central axis. 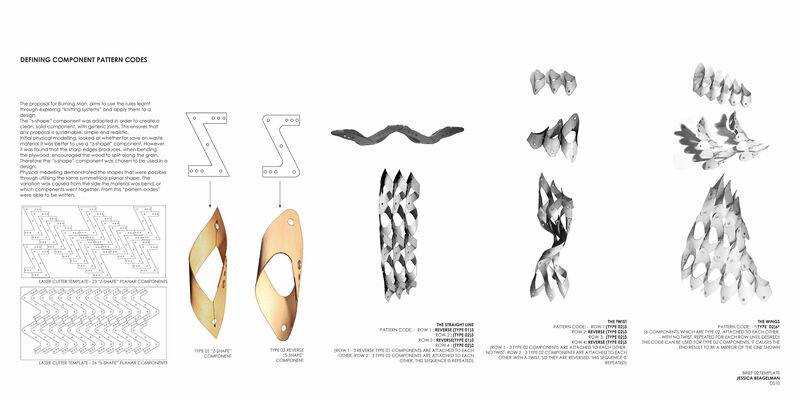 The curves of the panels are all related to each other, allowing the lanterns to be tightly packed together. The exterior form purposely deceives the Burner, enticing them to explore within and encase themselves in the individual lanterns. 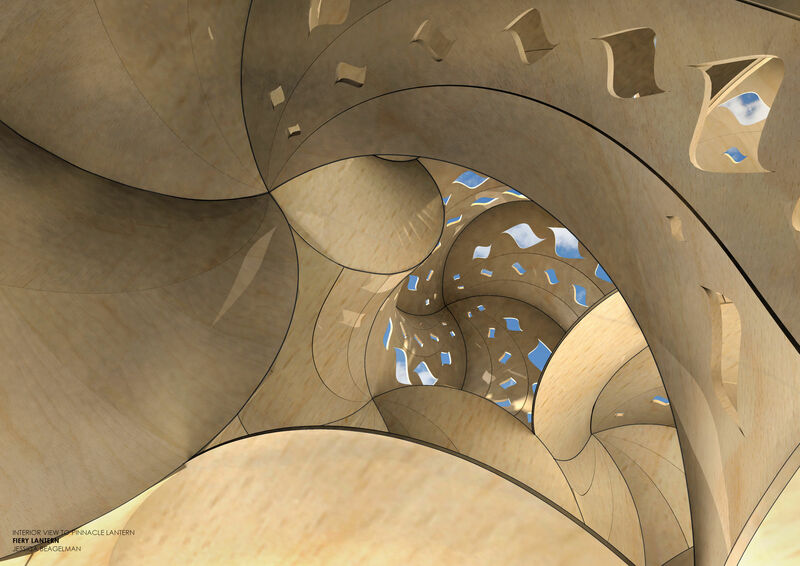 The internal maze encourages the exchange and interaction of cultural ideas, to proceed to the pinnacle shimmering lantern. The lanterns are driven into the ground, creating a solid structure, with no predefined front, back or side. The hidden internal entrance, allows Burners to search for the center of the “Fiery Lantern”, crawling or relaxing in the shade, connecting with the playa so as to reach encasement. 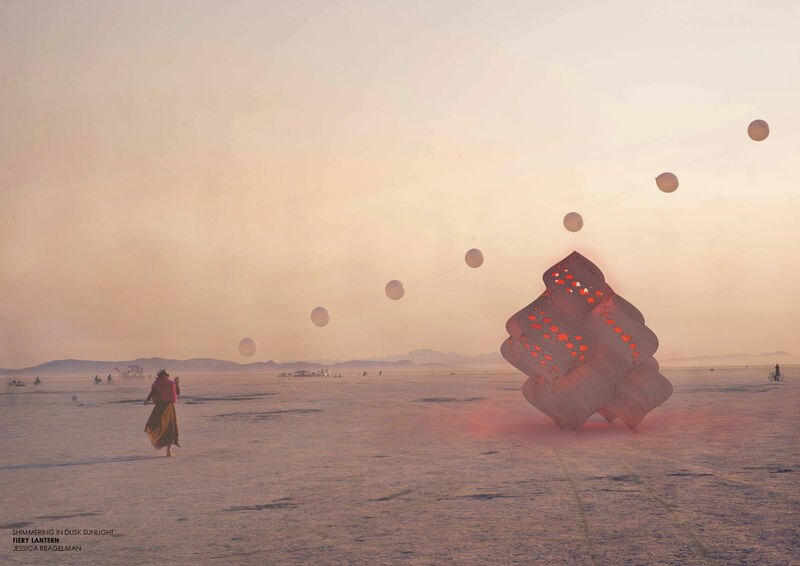 It does not create barriers in the vast landscape of the Black Rock City, but the lantern’s openings invite a glimpse of the vibrant treasure within. The Burner views the internal surprise and is encouraged to have their own sensory journey, weaving through the individual lanterns, taking their own experience and creating their personal connections. 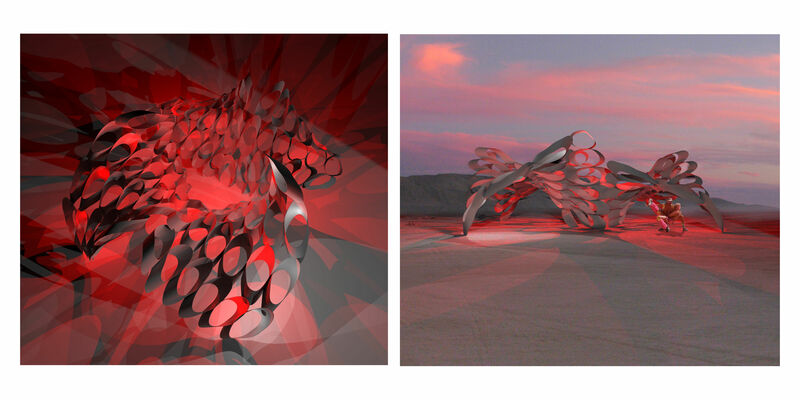 The pinnacle lantern, offers a perspective view over the playa, allowing the Burner reflection on the path below. Fiery Lanterns spirals out of the harsh compact playa ground in the vast expanse of Black Rock City, surrounded by Burners and art installations. Burners can interact with the installation, explore the individual lanterns and find the Burners encased within. They seek to reach the pinnacle lantern, for reflection on the way forward. As the sun sets at the end of the festival, the internal flames in the lantern will be extinguished and the installation burnt. 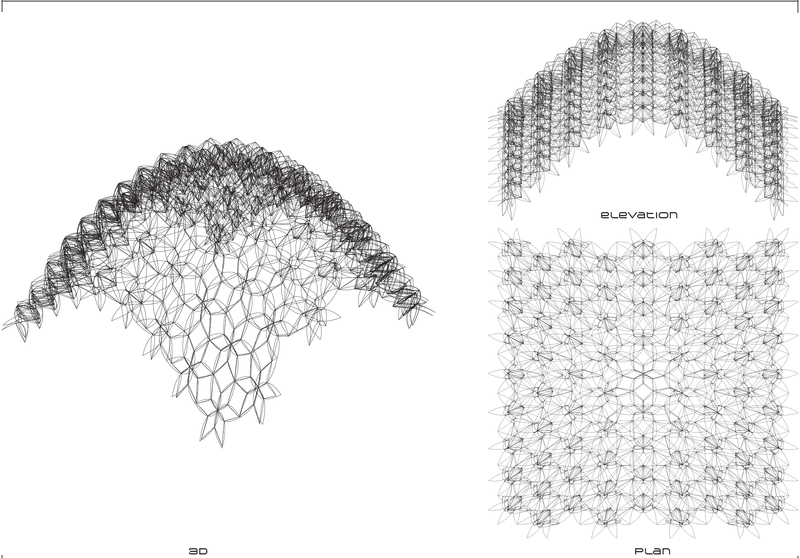 The installation has evolved through a detailed research into the natural repeating phsyllotaxis spirals in sunflower heads. 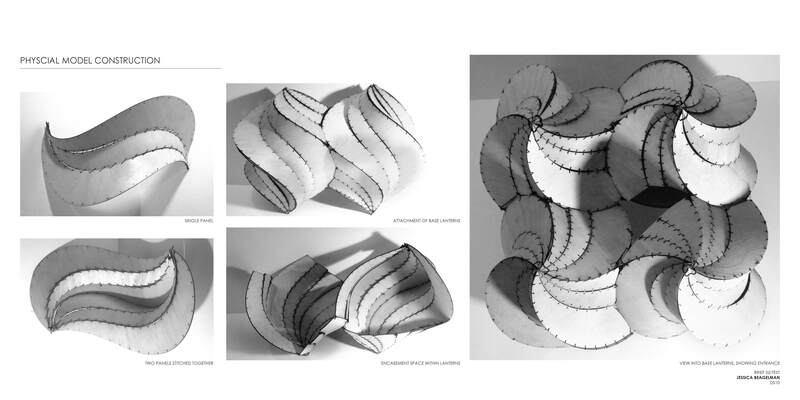 It is interesting to consider how each spiral is interconnected with the next and governed by the same set of mathematical rules, however changing the parameters changes the resultant architectural form. 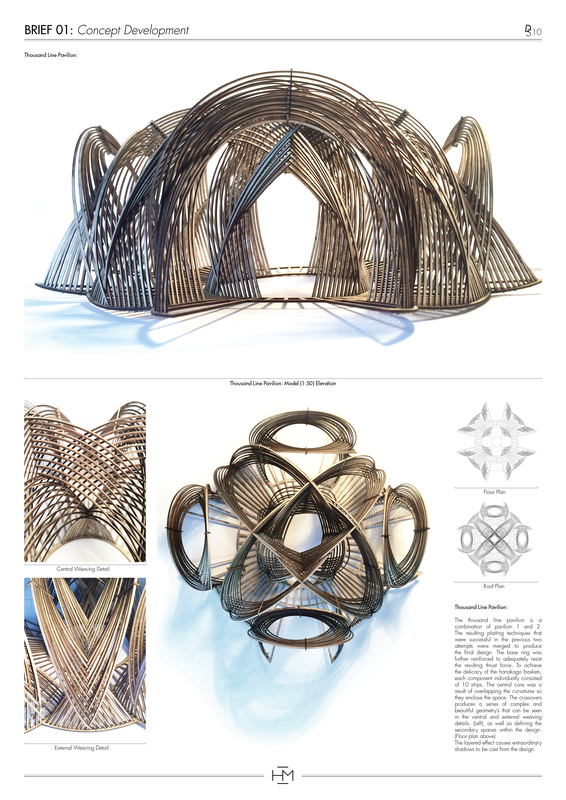 This is translated in the individuality of the Burning Man experience, the internal connections between the lanterns, offer the same experience, but generate differing personalised interactions with the Burners encased within. 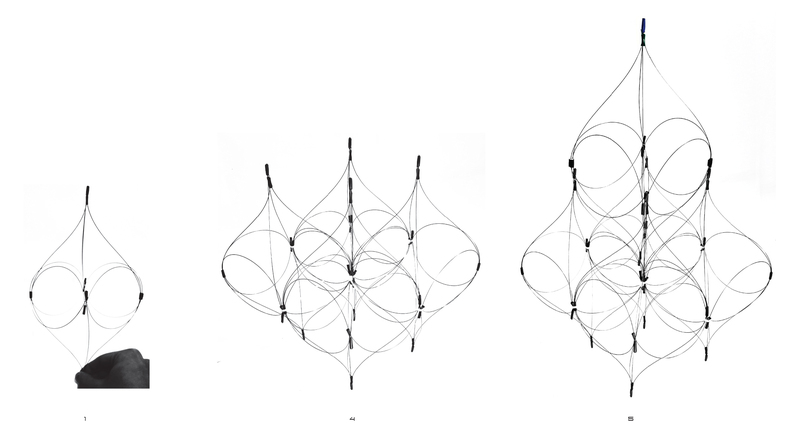 Physical modelling demonstrated how the related curves in the components, allows for the lanterns to be tightly packed together. 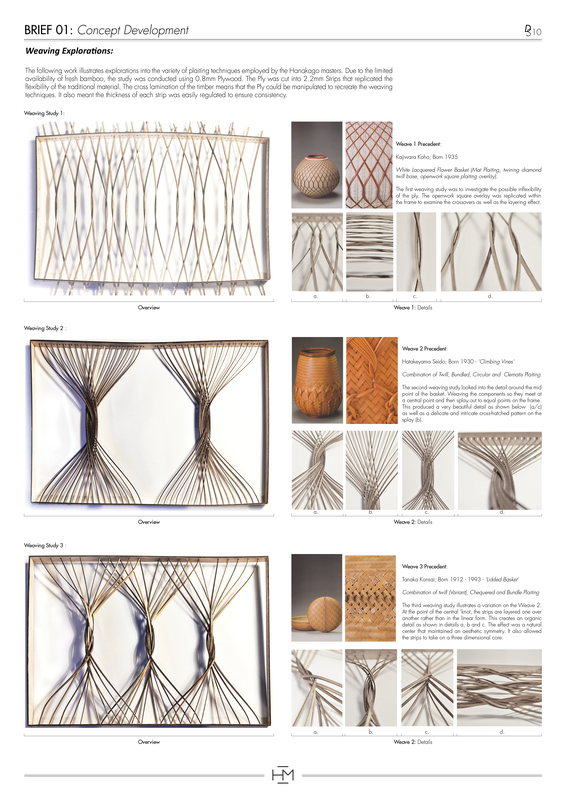 The repeating panels and simplistic design principle, enable open resourcing meaning once the Fiery Lanterns’ flame has been extinguished it can be resurrected at various scales, using the same laser cutting templates. 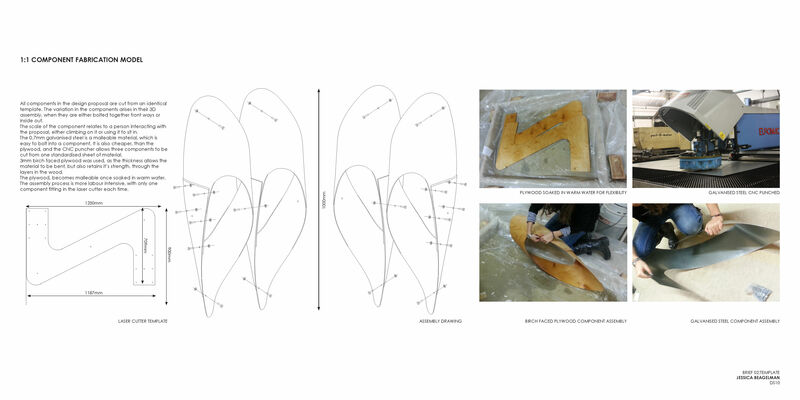 The scale of the lanterns, allows each component to be cut from a single sheet for plywood, meaning only repeating vertical seams are expressed. Each lantern is an intimate encasing, fitting one or two Burners. Burners must transverse through each lantern in order to reach the pinnacle, it encourages travellers to cross paths and initiate a cultural exchange. 12mm birch faced plywood is used, as the thickness allows the material to be flexible, but also retains its strength. 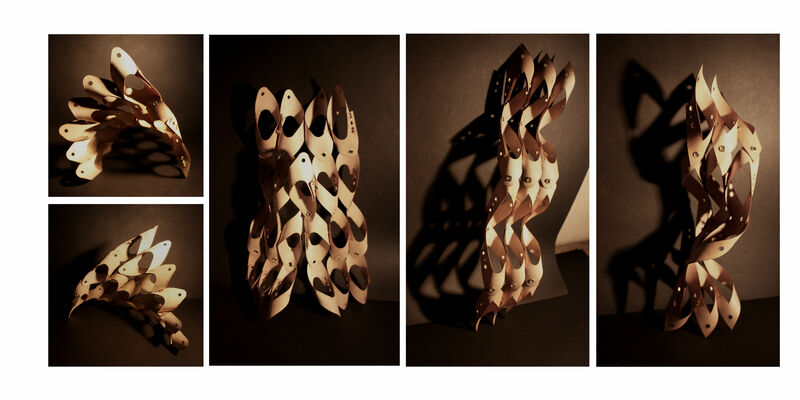 The plywood becomes malleable once soaked in warm water and can be stitched into the panels. The assembly process and onsite installation is simple and uses minimal bolts. The flame cannot be lit in the lantern until the ornate encasement has been completed. Construction commences through ground anchoring the secluded base lanterns. Soaking and stitching the panels for the internal maze, allows the form to evolve to enable the crowning of the pinnacle lantern. Once dry the Fiery Lantern is complete, the wood’s structural capabilities and sturdiness return, the flame can be lit and it can guide the souls of the playa. The internal space provides a refuge in the vast expanse of the landscape, shielding from the winds and creating a portal of shade. However, it is not a solitary experience; the openings allow all Burners access to the space. 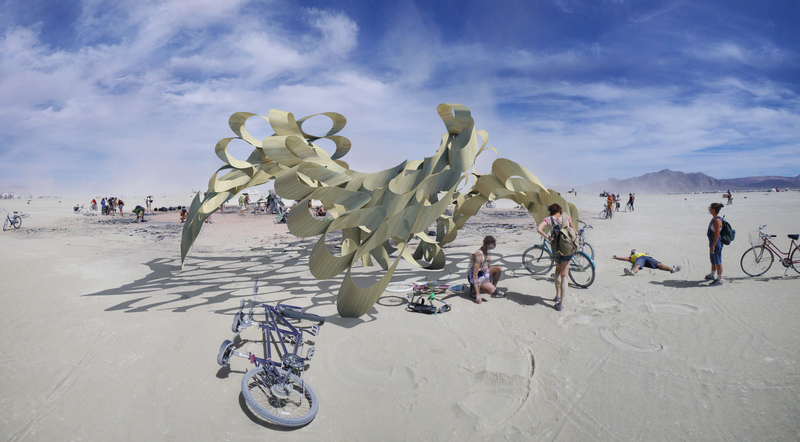 You are able to see out, past or through the structure to the rest of Black Rock City. The lack of a defined entrance means Fiery Lantern has a differing appearance from each angle. 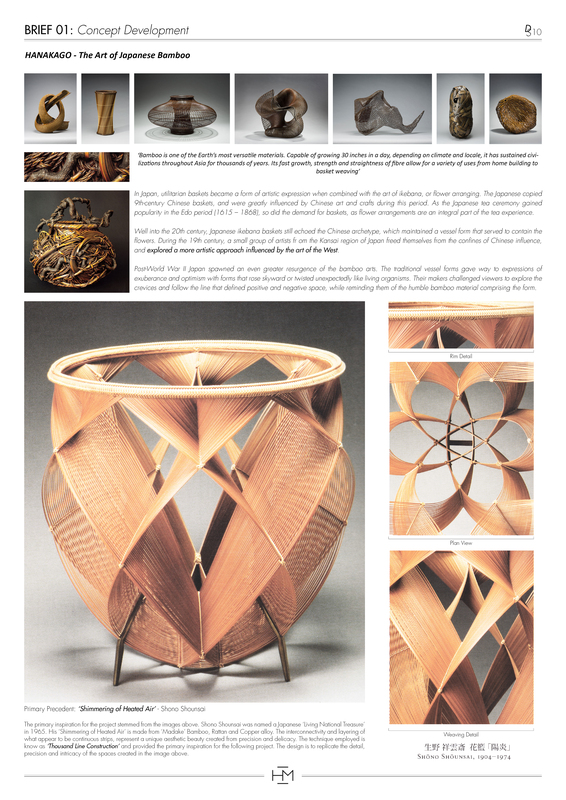 It encourages Burners to explore the proposal, to realise encasement. It draws them to the warmth and love of the flames within. The Butterfly has evolved through a detailed research into the system of knitting, which can be described as the art of systematically knotting thread in order to create a piece of fabric. It is interesting to consider how each stitch, essentially a different knot, produces a different effect, all previously calculated. 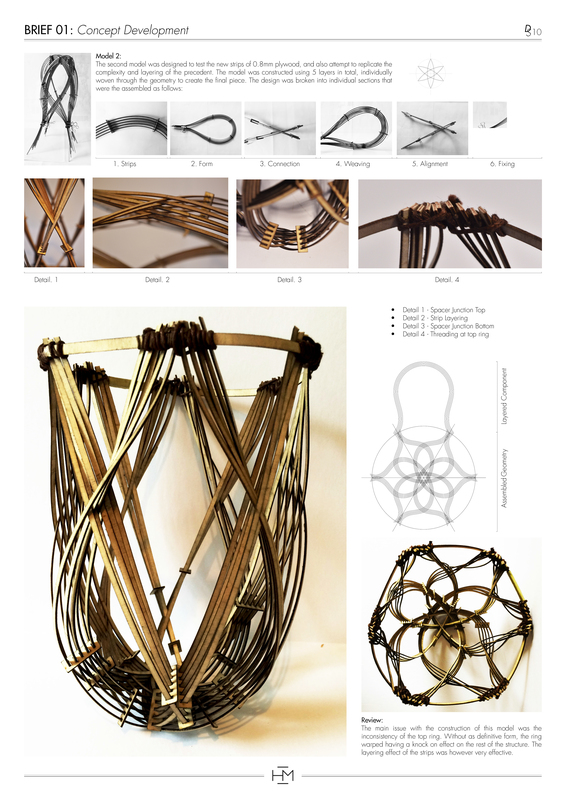 The proposal for Burning Man, aims to use the rules learnt through exploring “knitting systems” and apply them to a design. An “s-shape” component was adapted in order to create a clean, solid component, with generic joints. 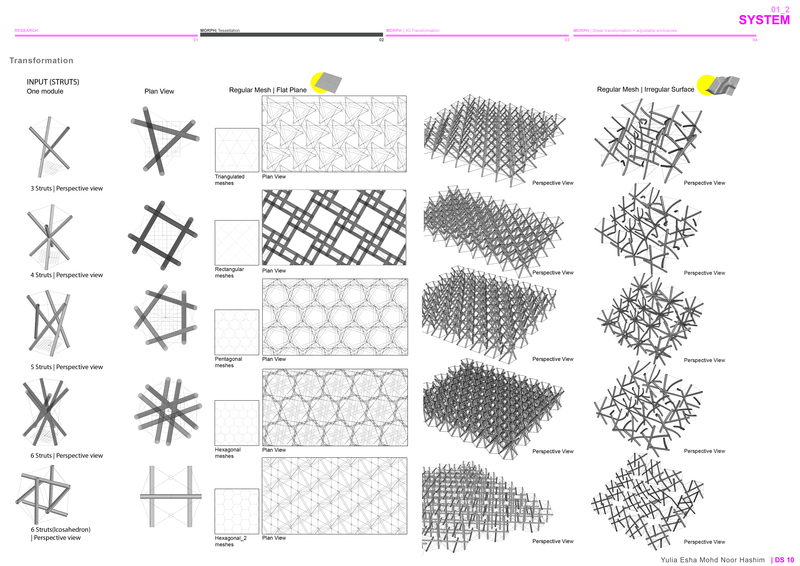 Physical modelling demonstrated the shapes that were possible through utilising the same symmetrical planar shape. The variation was caused from the side the material was bend, or which components went together. 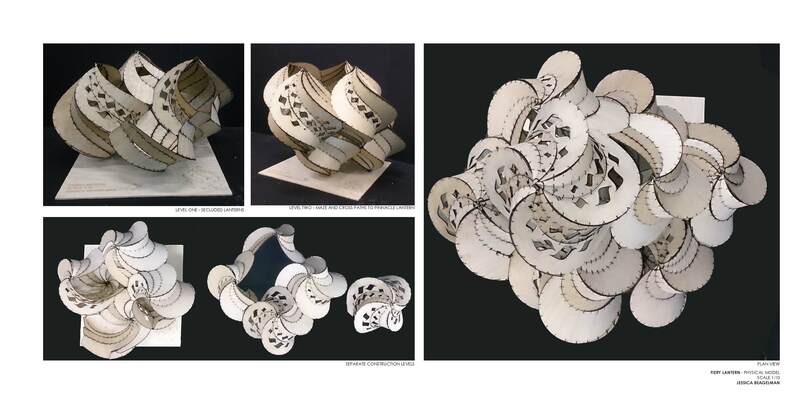 From this “pattern codes” were able to be written, meaning the butterfly, after its death, can be recreated, using the laser cutting templates and code. The scale of the component relates to a person interacting with the proposal, either climbing on it or using it to sit in. 3mm birch faced plywood was used, as the thickness allows the material to be bent, but also retains it’s strength, through the layers built up in the plywood. The plywood, becomes malleable once soaked in warm water and can be shaped into the component and bolted in place. The assembly process is simple and uses no high tech gadgetry. When a butterfly emerges from its pupal stage, it is not able to fly until its wings are dried. The installation uses this principle, for the components to be joined, they must be soaked in water. The installation evolves in this wet stage and once dry the true beauty of the wings materialise. The wood’s structural capabilities and sturdiness return once the plywood is dry. The Butterfly is made from four wings, which are symmetrical. Each are made from the same code, but another row of “stitches” is added on two of the wings, to create the variation in the height of the butterfly. 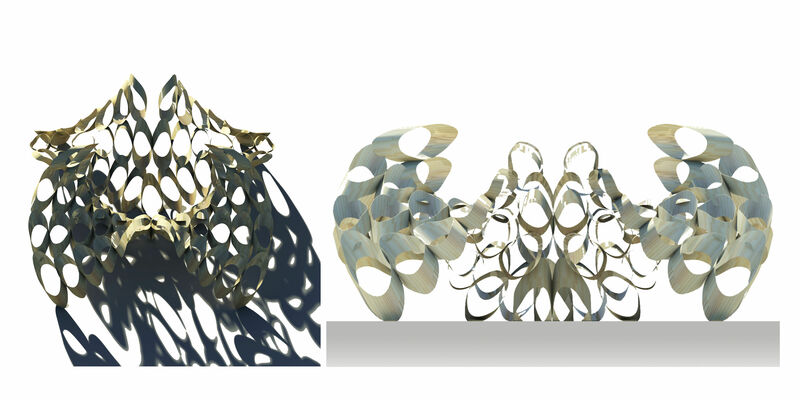 Like a butterfly, it lightly interacts with the ground plane, with rebaring grounding the proposal. The height of the design is kept purposely low, to allow for extreme wind conditions. 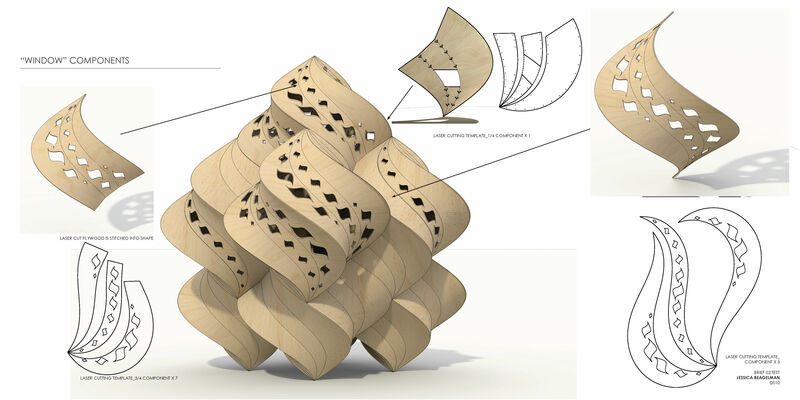 The design has a central core, where the plywood components meet the ground. The space provides refuge in the vast expanse of the landscape, at a scale more manageable. However, it is not secluded, all participants can access the space and you are able to see out past or through the structure to the rest of Black Rock City. Purposely there is no defined entrance to the butterfly, with the only hierarchy defined as the large arch, with more rows added. 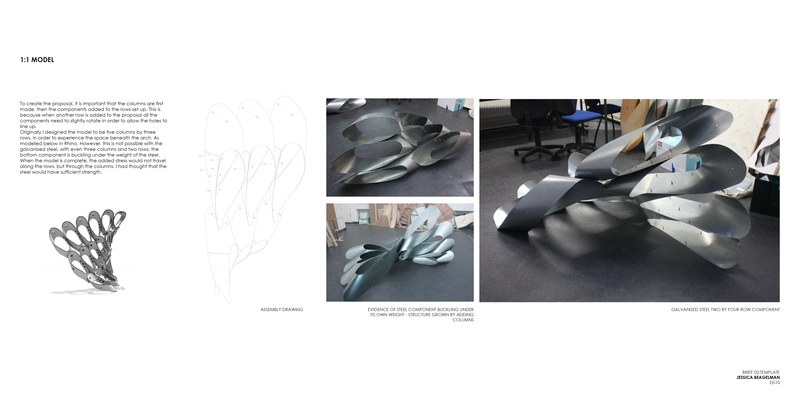 This means, from different angles the butterfly gives a different appearance, it encourages participants to explore the proposal, in order to fully understand its purpose and construction. The Butterfly is not just for interaction during the day time, however its main purpose is at night. Each column of components have the same colour LEDs embedded in them, with each wing of LEDs connected to each other. 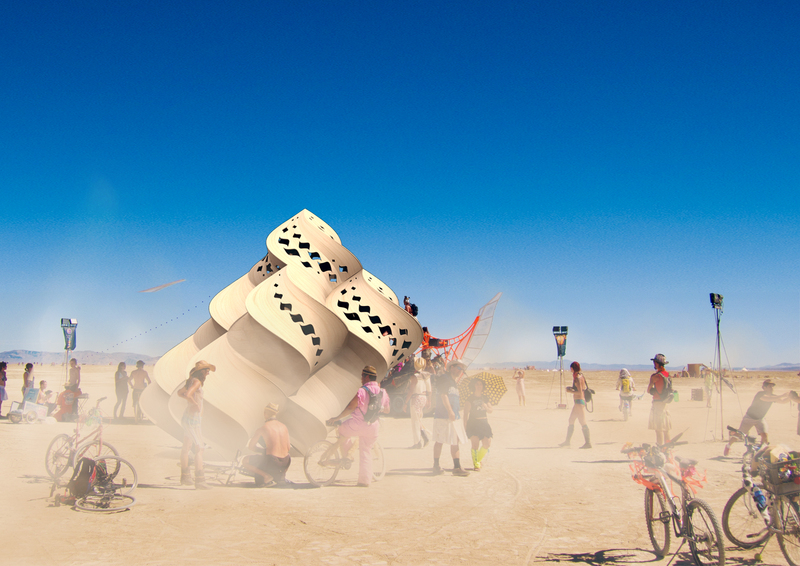 As the light fades over Black Rock City, the LEDs become active on a predetermined lighting sequence programmed into an Arduino processing board. Each column in the wings have a different colour LED meaning it is possible to programme the Arduino board, to allow the columns to come on in sequence. The darker the playa becomes the more columns of LEDs will come on, meaning participants are able to tell when night fall is. Eventually all LEDs come on to signify it is midnight and the sequence is reversed.